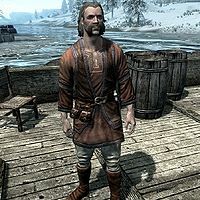 Dalan Merchad is a Breton warrior who works at the Windhelm docks. He serves as a sailor aboard the ship The North Wind, under the ship's captain, Kjar. He despises Windhelm and with the ship permanently docked, Dalan has no choice but to wander around on deck all day and night, without getting any sleep, at times pausing to sit down and eat. Dalan wears merchant clothing and a pair of boots. He wields an iron sword in combat, and carries a selection of common loot and gold. When approached, he will comment on the city of Windhelm, saying, "Never much cared for Windhelm. The place is depressing." as well as declaring, "I'm a lot happier out here on the deck than I am wandering around in that ruin of a city." He will also tell you about the Forsworn, saying, "I heard those Forsworn out west live in caves. Can't be any worse than trying to live in Windhelm." He may also express his desire to set sail again by telling you, "Can't wait until we raise anchor. Anytime the boat's not moving, I start to get impatient." Dalan is in the Winterhold crime faction, rather than the Eastmarch one. This bug is fixed by version 2.1.2 of the Unofficial Skyrim Patch. This page was last modified on 6 December 2017, at 19:27.